Denny Hamlin won his second-straight pole on Friday when he posted the fastest time in qualifying for this weekend’s Monster Energy NASCAR Cup Series race at Michigan International Speedway. But it was another streak which the Joe Gibbs Racing driver had on his mind afterward – his streak of winning at least one race in every season since joining the series full time in 2006. Hamlin has had multiple-win seasons the last three years. His top season in terms of wins was 2010 when he won 10 times. Five times he has had one-win seasons. What’s up with 2018, where he has had good runs but no wins? “It’s been just crazy things that have happened that you think can’t possibly happen,” he said. “We have had a tremendous amount of bad luck – luck and preparation and you get into that whole quote thing, but last week was luck from our standpoint. We weren’t doing anything and then we got a penalty from our side, from someone running over our pit crew guys so that was a crazy sequence and weeks before that. Pole wins are pleasant but they don’t get you automatic berths in the playoffs, which are now five races away. Hamlin hopes pole will, however, give his team momentum. Friday’s pole was won with a lap at 202.794 mph (35.504 seconds). And for the second straight week, he will line up on the front row with teammate Kyle Busch. 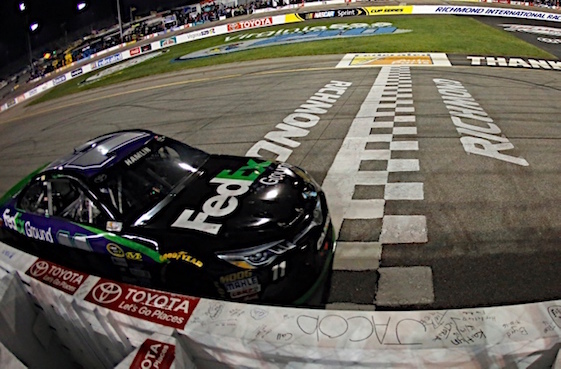 (11) Denny Hamlin, Toyota, 202.794 mph. (18) Kyle Busch, Toyota, 202.731 mph. (4) Kevin Harvick, Ford, 202.100 mph. (20) Erik Jones, Toyota, 201.805 mph. (3) Austin Dillon, Chevrolet, 201.748 mph. (31) Ryan Newman, Chevrolet, 201.658 mph. (78) Martin Truex Jr., Toyota, 201.421 mph. (12) Ryan Blaney, Ford, 201.309 mph. (22) Joey Logano, Ford, 201.230 mph. (88) Alex Bowman, Chevrolet, 201.185 mph. (10) Aric Almirola, Ford, 200.524 mph. (41) Kurt Busch, Ford, 200.033 mph. (17) Ricky Stenhouse Jr., Ford, 200.842 mph. (21) Paul Menard, Ford, 200.814 mph. (1) Jamie McMurray, Chevrolet, 200.574 mph. (14) Clint Bowyer, Ford, 200.267 mph. (42) Kyle Larson, Chevrolet, 200.072 mph. (2) Brad Keselowski, Ford, 199.590 mph. (48) Jimmie Johnson, Chevrolet, 199.496 mph. (24) William Byron #, Chevrolet, 199.231 mph. (9) Chase Elliott, Chevrolet, 199.077 mph. (43) Bubba Wallace #, Chevrolet, 197.721 mph. (37) Chris Buescher, Chevrolet, 197.596 mph. (38) David Ragan, Ford, 197.439 mph. (47) AJ Allmendinger, Chevrolet, 197.352 mph. (6) Trevor Bayne, Ford, 197.298 mph. (13) Ty Dillon, Chevrolet, 197.298 mph. (95) Kasey Kahne, Chevrolet, 197.287 mph. (34) Michael McDowell, Ford, 196.512 mph. (32) Matt DiBenedetto, Ford, 196.383 mph. (00) Landon Cassill, Chevrolet, 195.567 mph. (72) Corey LaJoie, Chevrolet, 193.533 mph. (51) BJ McLeod(i), Chevrolet, 191.744 mph. (99) Gray Gaulding, Chevrolet, 190.446 mph. (15) Reed Sorenson, Chevrolet, 189.663 mph. (7) Garrett Smithley(i), Chevrolet, 188.344 mph. (66) Timmy Hill(i), Chevrolet, 185.648 mph. (96) Jeffrey Earnhardt, Toyota, 184.054 mph. (23) Blake Jones, Toyota, 182.315 mph. (19) Daniel Suarez, Toyota, 0.000 mph.